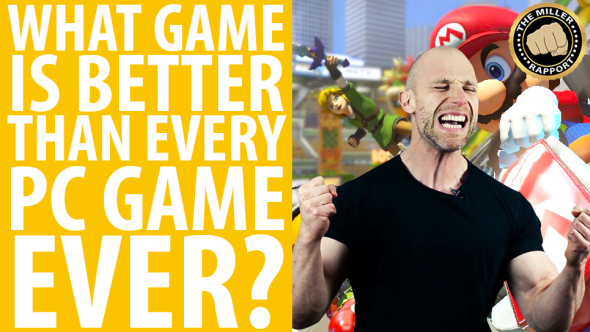 You might think you’ve played a PC game better than Mario Kart 8. Deus Ex, perhaps. XCOM, or Half-Life 2. But Simon Miller’s here to tell you, as ever, that you’re mistaken. Wrong. Factually incorrect. They may not be much, but these are the best PC games we’ve got. Where PC games tend to be confusing mish-mashes made up mostly of HUD, the Switch’s Mario Kart 8 Deluxe is a delightfully fun balance of challenging and accessible that doesn’t require a PhD in Being a Nerd to play. That’s how the argument goes anyway. The argument also involves a lot of yelling. Rumour has it a band of nerds killed Miller’s aunt and uncle. It’s as good an origin story as any. Don’t forget to check out Miller’s Patreon page if you’d like to show him your support. And for more of the moving picture PC gaming good stuff, subscribe to the PCGamesN YouTube channel. Not so much of the Mario Kart on there, we must admit, but plenty else.